10" Tall Two Piece Acrylic award with base accent color available in one of two base accent colors. Acrylic thickness is 1 1/4" thick, laser engraved to a frosted white text. Full color imprinting available as an optional imprinting method for this acrylic award. A Stunning acrylic award with base accent color available in one of six base accent colors and two sizes. Acrylic thickness is 3/4" thick, laser engraved to a frosted white text. Full color imprinting available as an optional imprinting method for this acrylic award. Accented with one of six colors, this slanted acrylic award is 3/4" thick and sits on a mirrored colored base with black acrylic bottom. Available in three sizes, laser engraved to a frosted white text. Full color imprinting available as an optional imprinting method for this acrylic award. The Beveled Mountain Peak acrylic award possesses a uniquely unsymmetrical appearance which is the central feature of this acrylic award. This classic is hand crafted from acrylic and hand polished to meet the highest standards! Available in your choice of blue, red, green, gold or purple reflective bottom. A simple, elegant design makes this acrylic award timeless! The Beveled Ovals are crafted from the finest acrylic and polished by hand to achieve the highest quality acrylic award. We offer three sizes of this product. Available in your choice of blue, red, green, gold or purple reflective bottoms. Base included! 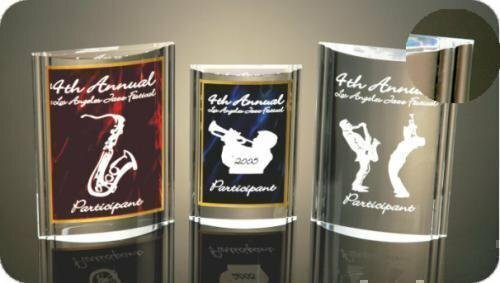 The Chipped Top Pillar acrylic award features a hand chipped top which gives it a beautiful bubbled look that dramatically reflects your choice of blue, red, green, gold or purple reflective bottom! Available in three sizes. 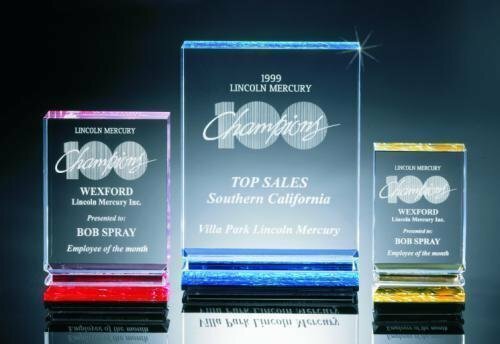 The Fluted Pillar acrylic award is a 3" thick super premium monumental award. It features four flutes on the bottom and is topped off with a beautiful pyramid peak, hand crafted to perfection. Available in your choice of blue, red, green, gold or purple reflective bottoms and your choice of four sizes!